The National Assembly (NA) Standing Committee held a working session on supervising implementation of BOT (Build-Operate-Transfer) traffic projects in the wake of heated protests over one of them in the southern province of Tien Giang. The BOT model, which primarily cedes construction of public traffic infrastructure to the private sector, has been utilised by the Government to alleviate the burden on the State Budget, especially after official development assistance (ODA) began running thin. In the 2011-2016 period, the Ministry of Transport (MoT) mobilised VND171 trillion (US$7.524 billion) for traffic projects, with 59 BOT projects accounting for 90.2 per cent (55 projects have been completed). These included many key connectivity projects including the Ho Chi Minh Road (the section passing through the Central Highlands) and expansion of the trans-Vietnam highway, National Road 1. However, a report by the thematic supervision working group has pointed out numerous issues plaguing BOT projects, especially in terms of toll collection that is used to recoup invested capital. Public feedback, especially from local residents and guild associations, has not been accounted for in determining where the toll booths would be located. In many cases, the toll has kept increasing while the quality of the roads degraded, according to the report. NA Vice Chairman Da BaTỵ said the locations of tollbooths and the toll levels were the direct causes of people’s protests. Tỵ said the Government should “buy back” the rights of toll collection from booths located less than the minimum mandated 70km from the nearest booth. Many members of the NA Standing Committee agreed that in the coming time, the government needs to conduct a thorough review of all existing BOT tollbooths, promulgate fresh criteria for their installation and establishing appropriate price brackets. They also suggested application of electronic toll collection on all national roads starting from 2019. NA Chairwoman Nguyen Thi Kim Ngan said the problems afflicting BOT projects in recent times arose because legal documents were not comprehensive enough, inadequate project planning led to frequent cost overruns and incompetent sub-contractors were selected without going through a proper bidding process. The Cai Lay BOT tollbooth (at km1999+300 on the National Road section that passes through the southern province of Tien Giang) has seen vehement protests. Drivers passing through the booth have collectively used small-currency notes to pay the toll, leading to heavy congestion as the cashiers need a lot of time to go through piles of cash to check whether the full fee has been paid. On August 13 at 6:45pm, with hundreds of cars waiting in line, the toll booth had to let all cars go through for free until 2am the next morning. The protests actually began in July, even before the toll booths were operational, when Facebook groups called on car drivers to use small-denomination currency notes to pay the toll as a means of peaceful protest. In addition, car drivers have told each other to go other routes to bypass the booth, which soon becomes a bother for nearby residents and a burden on smaller roads not designed for heavy loads of traffic. 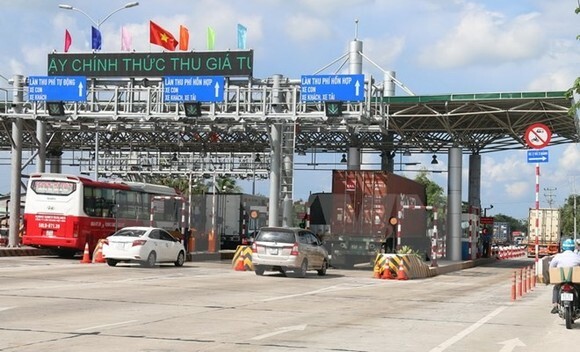 The investor of the Tien Giang BOT project said the setting up of the tollbooth on National Road 1 to collect toll from cars running on National Road 1 and the bypass road is “totally reasonable,” and was approved by the MoT, Ministry of Finance, and Tien Giang People’s Committee. Tran Van Bon, Tien Giang’s Director of the Department of Transportation, has asked the Vietnam Road Administration to think up ways to reduce the tolls and the agency said the proposal could be feasible.